The perfect present for a freelance translator has arrived! Mox: Illustrated Guide to Freelance Translation by Alejandro Moreno-Ramos is a must-have for all the translators out there with a sense of humor who are also willing to take some time to reflect on the actors in the translation industry and the role each of them plays. It is very likely that you will also pick your favorite and least favorite characters in Mox’s book (chances are you will find some similarities between yourself and at least one of them). So if you are a translator and you have not written your letter yet, make sure you add this item to your list. You’ll have a fun holiday season! 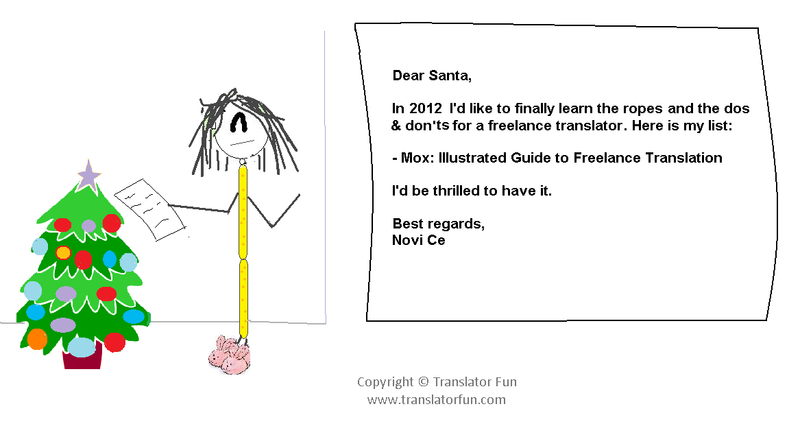 This entry was posted in Freelance translator, Fun, lifestyle, Translation, Translation Theory and tagged Alejandro Moreno-Ramos, Business, cartoon, Christmas, freelance translator, freelancer, Fun, humor, Mox, translation by Romina Bona. Bookmark the permalink.